Shirts With Random Triangles: Jim Harbaugh Coaches Dons Detroit Tigers Uniform, Coaches First Base In Spring Training Game. 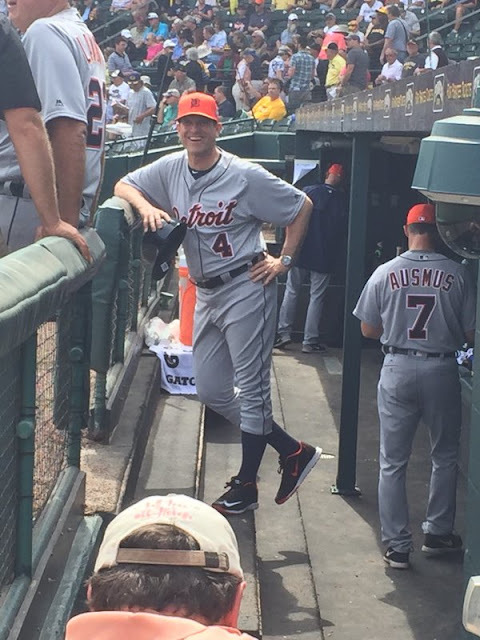 Jim Harbaugh Coaches Dons Detroit Tigers Uniform, Coaches First Base In Spring Training Game. Jim Harbaugh in Detroit Tigers uniform. Image via @MartySmithESPN. Remember last year when Michigan head coach Jim Harbaugh took some time out to help coach first base for the Oakland A's for a game during spring training? Well this year, Harbaugh is again trading in the khakis for a baseball uniform, only this time with the Detroit Tigers. As with last season, Harbaugh served as first base coach for the day. Here's Harbaugh in full uniform. Like last season, Harbaugh went with the more traditional look with the high socks. Sadly, he still hasn't gone full Hunter Pence with the socks up to the knees. Harbaugh and the Wolverines are spending a week in Florida for spring practice, much to the chagrin of SEC coaches, who are forbidden by the conference from partaking in similar stunts outside their individual state lines. Labels: Big Ten, Detroit Tigers, Jim Harbaugh, Michigan Wolverines, That's So Harbaugh! Florida's New "Chapter 2" Hype Video. Austin Hardin Is An Ex-Florida Gators Kicker. Anthony Jennings Is An Ex-LSU QB. Bill Cubit Is An Ex-Illinois Head Football Coach.